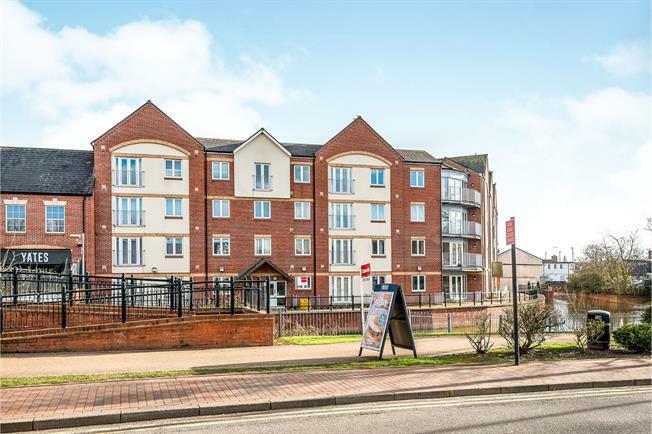 2 Bedroom Flat For Sale in Stafford for Offers Over £110,000. Modern second floor two bedroom apartment, located in the popular riverside complex. With open plan kitchen/lounge area, bathroom and two bedrooms together with parking space. Having doors to all rooms, storage cupboard and boiler cupboard. Measurement 2.806m is minimum measurement and 5.539m is a maximum measurement as the room is an irregular shape) Having kitchen area with a a range of wall and base units with work surfaces over incorporating a single draining sink unit, built in cooker with hob and cooker hood over and space for fridge freezer and double glazed window. The lounge area, has double glazed french doors with juliette balcony and electric wall heater. Having double glazed window, built in wardrobe and wall heater. Having panelled bath with shower over, pedestal wash hand basin and low level WC, heated towel radiator and tiled splashbacks.